Chiyogami paper frequently pops up in my work. 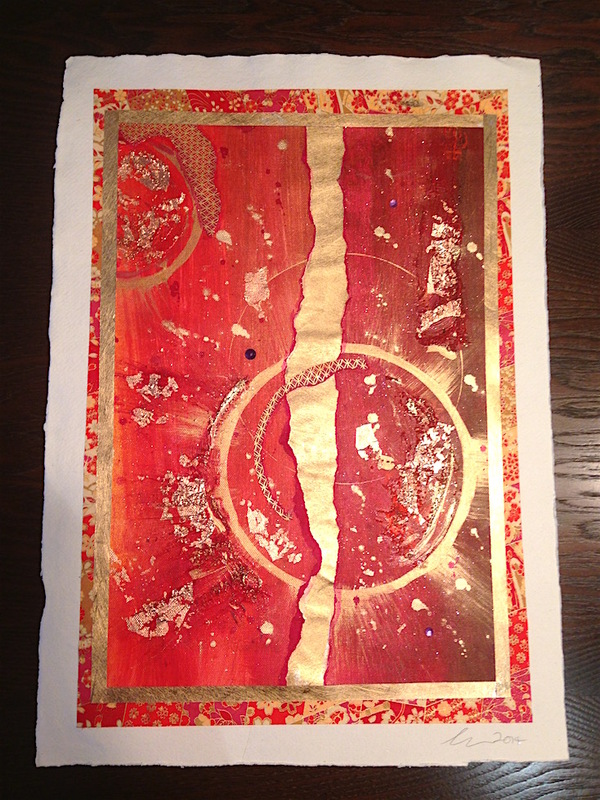 I started using the gorgeous handmade Japanese paper for my cards and then graduated to bigger works. 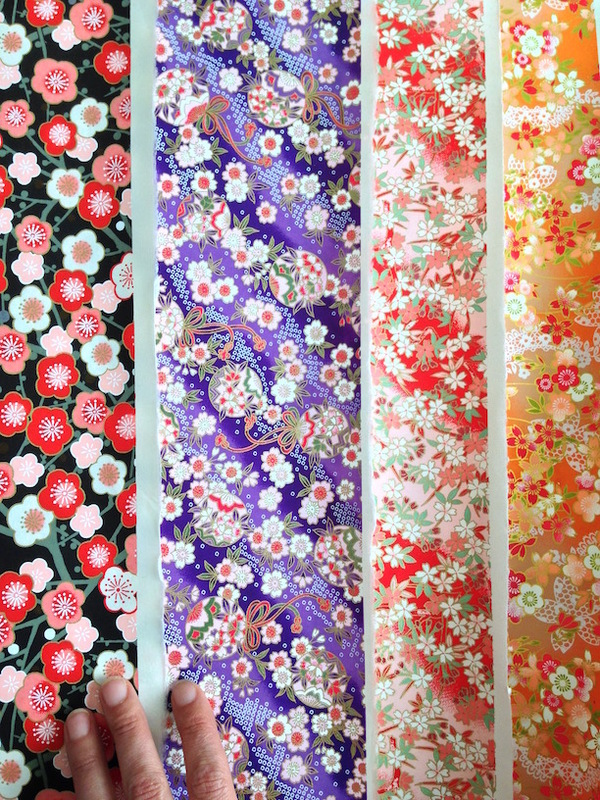 In fact, chiyogami paper is a bit of a silly thing to say since the ‘gami’ part of the word actually means paper. But you get the picture. Speaking of pictures, I’ll soon be making plenty more. Yesterday an email from US company the Rare Orchid arrived, detailing new chiyogami in their range. I still have a beautifully wrapped package of theirs from last summer, waiting to be turned into paintings. I also sent off for some chiyogami to Shepherd Falkiners in London, a veritable Aladdin’s cave. When I ordered it the blue, wheely paper had already sold out, but they kindly held my order back until it was back. Unfortunately – for my bank account, that is – they’ve been stocking up on more goodies since! I first started using chiyogami in Japan (naturally!) when I discovered small sheets on sale at Loft, a fantastic department store in major Japanese cities. Although it can be quite pricey (even in Japan), Loft and Tokyu Hands, also in Japan, do smaller and more affordable sheets. 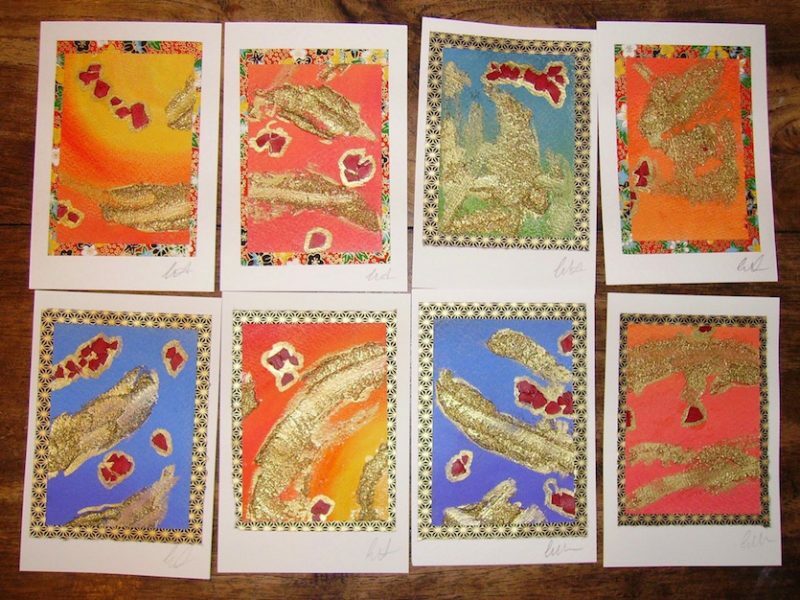 And so I created lots of mini paintings which I put onto a a backing of the colourful Japanese paper and then onto a plain, textured art postcard. Seeing these again brings back memories of a very busy weekend. For I made well over sixty of them for students and staff alike when I left my first school. Phew! A few years back I sold one of my favourite paintings, a bright pink affair called Happy New Year! which conjures up fireworks, chiyogami and gold leaf. Later on the customer asked me to make pieces akin to my cards as I’d included a few in her purchase. I suggested loosely basing them on the four seasons. You can see two of them below, though they’re not the greatest photos. Not only was I pretty pleased as punch, but she was too (much more important, of course!). I’ll certainly be adding more such works to my repertoire. More recently I made these green pieces for a client. You can see I’m still using the torn paper frame to set the work on which I think gives it a good edge, both literally and artistically. Although I can’t take credit for that idea, as it was the lady who ordered the seasonal pieces above. 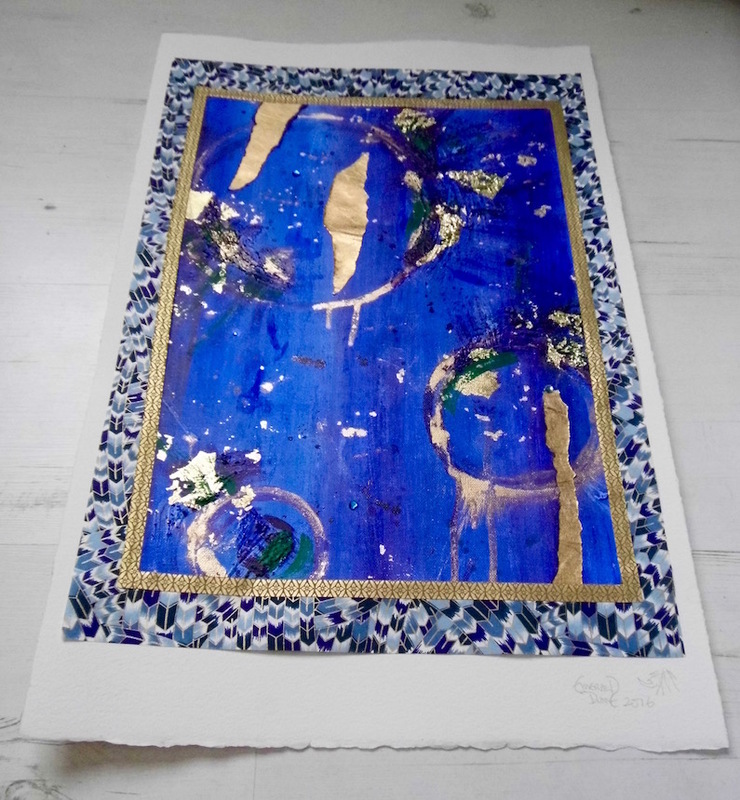 I like to use two different types of chiyogami paper in these works so that the frame and the the smaller pieces I use in the painting itself are different, though correspond to the main colour of the work. 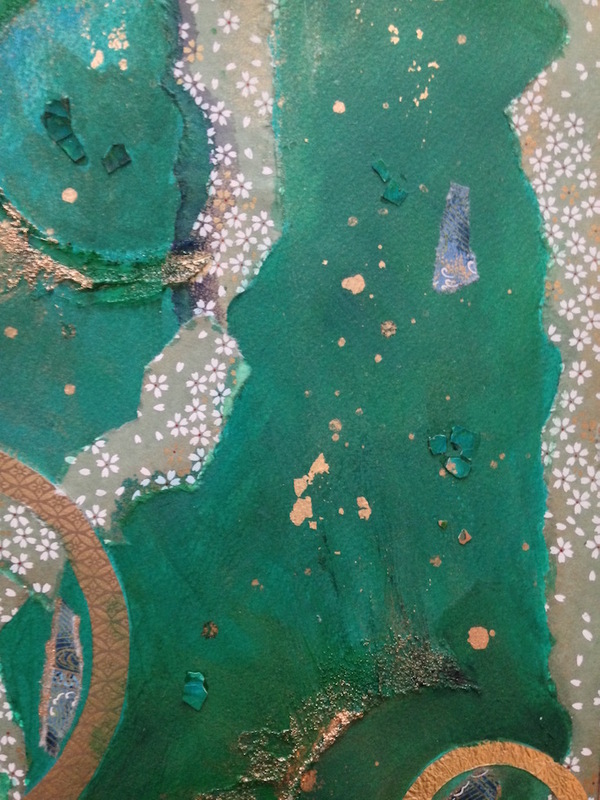 With the piece below, however, the client had a very particular view of how she wanted her painting to appear. 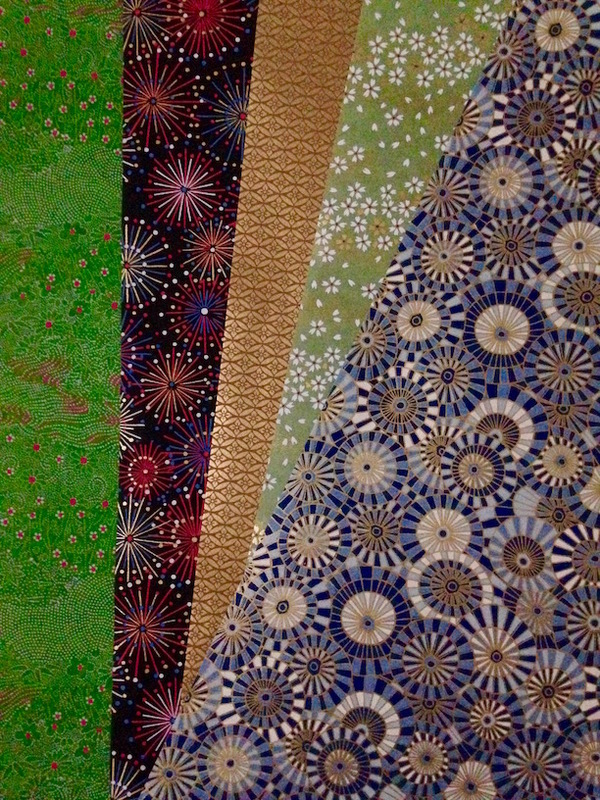 That’s why I kept the same gorgeous green daisy paper from Shepherd Falkiners in her work. I loved it enough to buy more when it came back into stock. 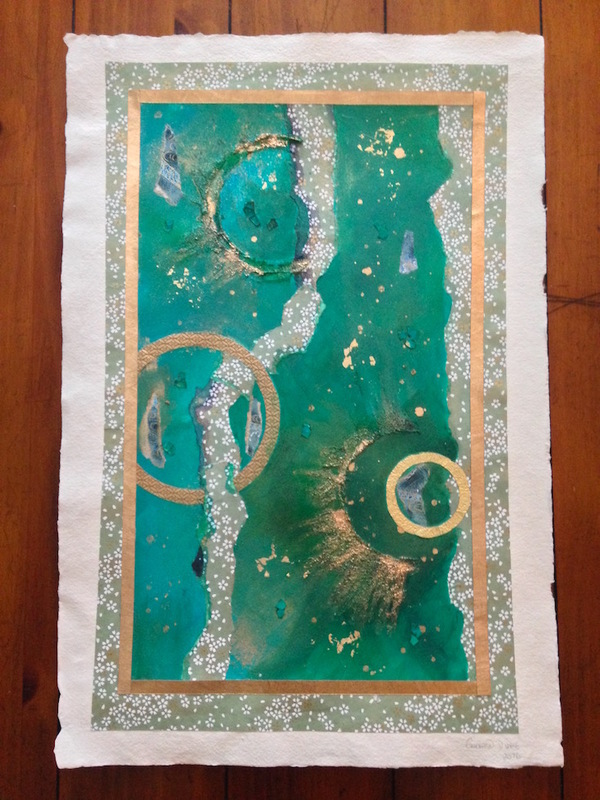 I also bought the gold unryu paper from there for the frame. 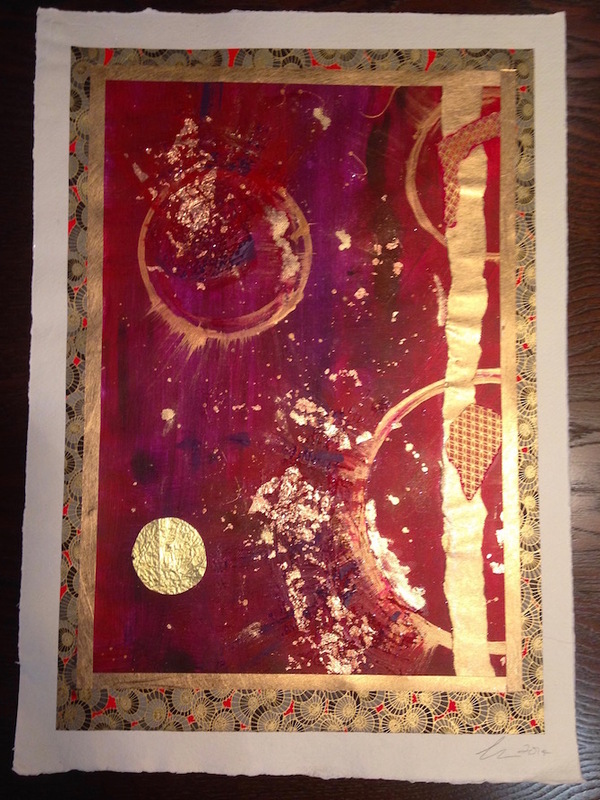 Many years ago they sold a beautiful textured gold paper with a red backing. Alas their stockists no longer supply it, but I did see some in Tokyu Hands many years ago and brought plenty back. What unusual materials do you use in your work? If you’re not an artist are there any that you particularly like to see? Do share all in the comment section. "Yoga and Art : Combining two passions"